Canada scored in the second minute of stoppage time to win the bronze medal in the women’s tournament this morning. The USWNT faces Japan today in the Gold Medal match at the Olympics (2:30pm, NBCSN, Live Extra). Some 83,000 spectators are expected for the final at Wembley. The existing record is 76,489 for the USA vs. China final at Sanford Stadium during the 1996 Atlanta Olympics. In case you’ve been living under a rock, the US is motivated by their loss to Japan in the World Cup final. Japan Daily Press says great mutual respect exists between the two teams. Here’s a quote sheet from US Soccer on the players thoughts about Japan. If the team wins the gold, the players will share a $1.5 million bonus from US Soccer. In addition, each player will receive a $25,000 bonus from the US Olympic committee ($15,000 for silver). ProSoccerTalk praises to Megan Rapinoe, who scored the brace that kept the US in the semifinal game against Canada. SI profiles Cristie Rampone, the “glue” on the USWNT. 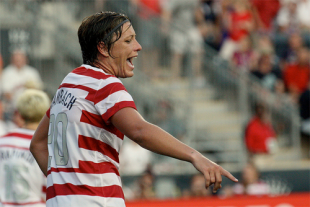 The gold medal match will be her last with the USWNT. Is Alex Morgan the new face of the USWNT? What do you know, a Canadian report that mentions Melissa Tancredi’s head stomp on Carli Lloyd—seven paragraphs into the article. Did you know Canada goalkeeper Erin Mcleod played college soccer for Penn State? Mia Hamm has been enjoying the USWNT’s Olympic run. A SB Nation writer describes how the USWNT has made him care about international soccer again. Sporting Kansas City defeated Seattle Sounders on penalty kicks after finishing 1–1 following extra time in a US Open Cup final that will be remembered as epic in length but will hardly be called legendary. The Cup.us and Sporting News have match reports. ESPN called the final hard to watch but easy to love. Hackworth mentioned Chandler Hoffman and Josue Martinez as possible replacements for the suspended McInerney. Will Bakary Soumare make his Union debut against Chicago Fire, his former team, on Sunday? Union Tally says he’s “poised” to do so and the Brotherly Game says it would be fitting for him to get the start against his former club. ProSoccerTalk has the Union at No. 14 in their power rankings and pretty much out of playoff contention. Canadian French-language site Soccer Plus calls the Union the league’s the most undisciplined team based on a point system of yellow and red cards. Harrisburg City Islanders improved their playoff chances with a 3–0 win over ten-men Charleston Battery on Wednesday night with goals from Brian Ombiji, Tom Mellor and Lucky Mkosana. More on the win here. MLS has released a new set of standings tiebreakers ahead of the playoffs. The first tiebreaker is goals scored “in part to encourage attacking play.” Why new rules would be introduced in the middle of the season is beyond me. New York have acquired Luis Robles, the American goalkeeper who is returning to the US after five seasons in Germany with Kaiserslautern and Karlsruher. Houston Dynamo have confirmed the signing of Ricardo Clark. No word yet if any of the USWNT players at the Olympics will be part of the new league. Philly Union Talk looks at USMNT roster options ahead of next week’s friendly in Mexico. Jurgen Klinsmann will announce the roster on Sunday. Tony Hibbert grew up in Merseyside, rose through Everton’s youth system and has played for the senior team since 2001. But in 309 career matches, he never scored a goal. That is until his testimonial game on Wednesday. Cue joyous bedlam. Liverpool owner John Henry says he is prepared to sell the naming rights to Anfield. Playoffs or not, we have a good young team playing attractive soccer and meshing. When your team is not looking good for the postseason, that is the next best thing. That is why I don’t want to Nowak it up and bring in “veterans” for no reason or try to spend big on someone. Let this season play out, let these young players grow together and show what they got, and then we can go into the pre-season knowing what we really need and making smart moves then. I don’t think we have achieved attractive soccer. Attractive-er than Nowak? yes. Actually good to look at? No. Not yet. Agree. Lots is lacking, especially plan B if things do not go as per plan (and if other teams have figured out Hack’s strategy). I agree. Frankly, it’s a minor miracle that we’re even still even in the playoff hunt this far into the season after being hobbled so badly by Nowak. Yeah, I’ll be pretty disappointed if we don’t make the playoffs, but I’m more concerned about rebuilding for next season and developing our young guys into world beaters. Hoppenot had the fear of god in his eyes as he was watching Rivas approach him…dude was totally scared. Ya mess with a big dog and ya might get bit. Dogs that bite should be put down. Unfortunately, MLS prefers to swat them with a rolled up news paper and welcome them back into the house.